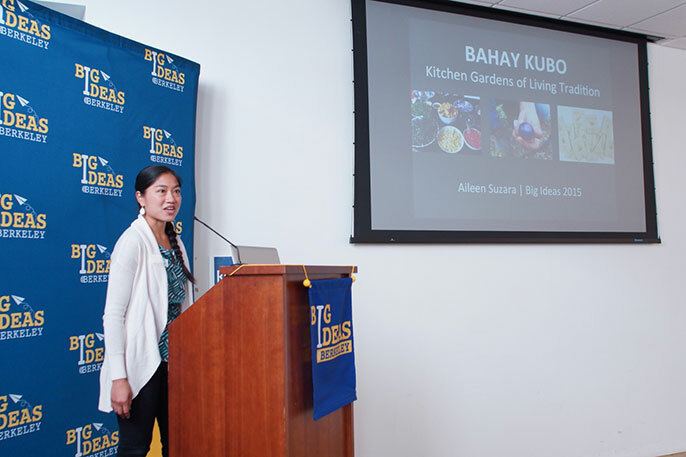 Aileen Suzara presents Bahay Kubo — Gardens of Living Tradition at the Big Ideas 2015 Grand Prize Pitch Day. On May 5, the UC Berkeley Blum Center for Developing Economies celebrated the eight-month journey that was the 2014-15 Big Ideas @ Berkeley student innovation contest with an awards celebration recognizing 46 winning projects for social change. This year, the contest received a record number of applications from 201 teams representing more than 700 students across nine UC campuses and 17 other universities. The teams presented hundreds of innovative ideas to address today’s most pressing issues — from the need for financial literacy among U.S. students facing college debt to the best way to produce sustainable energy in rural Kenya to cleaning water for crops in Guatemala. Students at the event could be seen smiling and nodding. “During our project design, our mentor — an international development expert — helped us a lot in thinking about how to devise a sustainable model that would actually scale,” said Linlin Liang from Michigan State University, who worked on the m-Omulimisa SMS Services project, which shared first place in the Food System Innovations category and provides agricultural support to farmers in Uganda through mobile technology. The other first place winner was Bahay Kubo, a UC Berkeley team that revitalizes Filipino food and culture to promote health through the creation of a culturally based garden and culinary arts program. “Culture is a key ingredient to both health and healthy food systems,” said Bahay Kubo’s Aileen Suzara, a UC Berkeley graduate student in public health who completed the Apprenticeship in Ecological Horticulture program at UC Santa Cruz. Big Ideas is one of the biggest inter-campus efforts in the University of California and the nation. It brings together such entities as the UC Berkeley Blum Center for Developing Economies, Berkeley Energy & Climate Institute, Texas A&M’s Center on Conflict and Development, U.S. Agency for International Development, USAID’s Higher Education Solutions Network, the Center for Information Technology in the Interest of Society, the UC Berkeley Food Institute, the UC Global Food Initiative, Michigan State University’s Global Center for Food Systems Innovation, the Associated Students of the University of California, and AidData at the College of William & Mary — as well as 150 judges and 45 mentors. Primary support comes from the Rudd Family Foundation. This year’s contest categories included Clean & Sustainable Energy Alternatives, Conflict & Development, Creative Expression for Social Justice, Food System Innovations, Global Health, Improving Student Life, Information Technology for Society, Mobiles for Reading, Open Data for Development, and Scaling Up Big Ideas. The new Food System Innovations category, sponsored by the UC Office of the President, Berkeley Food Institute and Blum Center for Developing Economies, received 41 applications representing 125 students, including ones from nine UC campuses. Students not only spend hundreds of hours researching social impact solutions — they also learn to refine and, as important, sell them. Among this year’s first place winners were BCAPI, a team of five UC Berkeley undergraduates that is developing a software and hardware package to help people with physical disabilities better drive wheelchairs, write and communicate. BCAPI’s technology relies on advancements in brain-computer interfacing. The BCAPI team won the $8,500 first place prize in the IT for Society category as well as $5,000 from the Campus and Community Impact Pitch competition that took place on April 28. Other double awardees included the UC Davis team Clean Water for Crops, which seeks to implement a water cleaning system in Guatemala using sand filtration and a local moringa seed to treat the contaminated water of Lake Atitlán. Clean Water for Crops team members emphasized that an important part of their idea was not just the ease of use of the technology, but the community engagement process. “Our mentor Khalid Kadir made us think about the political and community impact of the work — and that the technology is the easy part, while ensuring community involvement is a lot harder and crucial to sustainability,” said Kyle Fuller, one of the graduate student team members. Fuller, like many who have competed for and won Big Ideas, see their experience as the beginning of a lifelong quest to scale this or another social impact project. Over the past nine years, Big Ideas participants have gone on to secure over $45 million in additional funding — and dozens of projects have emerged as successful and sustainable for- and non-profits. Summaries for all 46 award winning big ideas can be found at http://bit.ly/1ER3YPx. 1st Place: BCAPI (UC Berkeley): BCAPI is developing a powerful software and hardware package that will enable technology developers and researchers to create a range of brain-computer interfacing (BCI) technologies to assist people with physical disabilities who lack control of their bodies but still control their minds. 2nd Place: Bahay Kubo – Gardens of Living Tradition (UC Berkeley): Bahay Kubo (“Little House”) revitalizes Filipino food and culture to promote health through the creation of a culturally based garden and culinary arts program. Bahay Kubo’s purpose is to lift up sustainable, healthy Filipino food practices that can ignite a culture shift toward good health. 3rd Place: Responsive City Lights: Urban Streets as Public Spaces (UC Berkeley): Responsive City Lights uses interactive light installations to enhance the perception of streets as engaging public spaces. The project reduces crime by increasing foot traffic and pedestrian interaction, bringing the Internet of Things into urban spaces to help fulfill a vital social need. 1st Place: Clean Water for Crops: As Simple as Sand and Seeds (UC Davis): This project will construct and operate a pilot-scale, slow seed-sand filtration system at UC Davis to assess the feasibility of a drinking water treatment technology, prior to building a pilot-scale system in Sololá, Guatemala, in order to adjust the system to local conditions. 2nd Place: Amplify Impact (UC Berkeley): Amplify Impact raises global awareness about social innovation in the Middle East by providing an online platform for nonprofits and socially minded for-profits to produce and distribute story-driven, low-cost videos. The team envisions a world where initiatives that are catalyzing opportunity, hope and positive change receive the attention they deserve. 3rd Place: Creating Decodable Readers in Haitian Creole (College of William & Mary): This project employs local teachers to create and teach reading materials that integrate Haiti’s mother-tongue and native culture. At its core, it is a software application that enables writers to create books for beginning readers using a systematic phonics approach.